I just won the Jacqueline Gold WOW award for women in business! This week I was thrilled to receive a #WOW award from Jacqueline Gold CBE, CEO of Ann Summers. 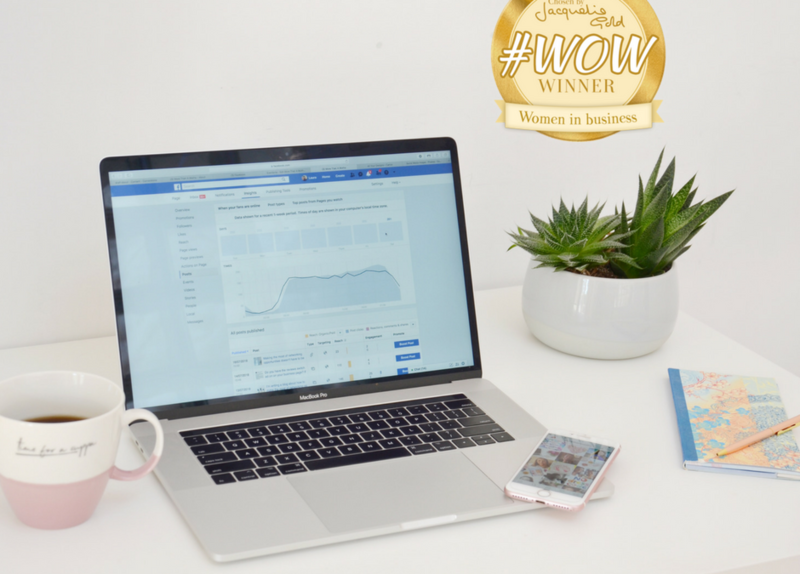 Every week Jacqueline invites female entrepreneurs to tweet her using the #WOW tag about their businesses, and she chooses 3 winners. I’ve come across many lovely businesses in the past simply because they won this award and been mentioned by Jacqueline Gold. Some, like Don’t Buy Her Flowers, were at the start of their journey and I’ve watched in admiration as they have gone on to become incredibly successful businesses. As you know, my business is brand new, I have working in social media for a long time, but my business only formally came into existence in February 2018. It’s just me, I don’t have a team of staff or any colleagues which just proves that no matter what the size of your business you can enter, and win, awards! Someone has to win and there’s no reason at all that it shouldn’t be you! But even if it isn’t, simply entering or being shortlisted can reap great rewards. Entering business awards is a great way to think critically about your business as you write your application. You may have to answer in depth questions about your strategy going forward, so this is a great time to think clearly about where you are headed. Even as a new business, this is a worthwhile exercise. Simply being shortlisted for an award can help to improve brand awareness and help to promote your business to new customers. Winning gives you something extra to shout about. You can write a blog (like this one), approach local press to cover the story and send out newsletters to your email list. It’s a perfect opportunity to create some great social media content across all your platforms and in different formats. You could go live on Facebook or Instagram as you collect an award at a ceremony, share photos of your award on Twitter, pin a blog about the award on Pinterest. The options are endless! We all suffer from this at some stage or other and having someone else telling you they believe in what you’re doing is always going to help, but winning an award can help boost your confidence no end. Knowing that a business expert has taken a look at your product or service and sees the value in it, or believes it worthy of an award is enough to sack that imposter and give you a real boost to succeed. Local awards are often judged by local business owners so being shortlisted gives you an opportunity to network with them, ask their advice and get your business ideas in front of them. Online awards, such as the #Wow award often have an online forum for the winners, allowing you to network with other winners and build relationships for the future. If you need tips on how to make a lasting impression when you get opportunities to network, read this. Getting a 3rd party endorsement for your business by winning a business award or being short-listed can be invaluable. A win can give potential customers a sign that your business is award winning and therefore trustworthy. It’s a great way of differentiating your company from competitors and will send out positive signals to customers. And of course can display your award status as a badge on your emails and website.